In May, Pandigital came out with the white Novel, the first Android-based ebook reader, which promised to run Android apps at some point in the future. Today, an upgraded model, the black Pandigital Novel, hits store shelves for $199–without apps, but with the promise still intact. The only significant difference between the white and black models is size. The black has a slightly smaller body and weighs 11.8 ounces (versus 19 ounces), which makes it more comfortable to hold for extended period of time. Plus, you get an additional 1GB of internal memory, for a total of 2GB. Though both models can take up to 32GB SD memory cards. The Pandigital Novel feels good in your hand. At 11.8 ounces and measuring about 5.1 by 7.1 by .5 inches, you don’t get hand fatigue even after hours of reading and the Novel’s .5-inch bezel provides a comfortable place to rest your thumbs without fear of inadvertently turning the page. The device is obviously made from plastic, but it still feels sturdy. The buttons are very small, though—small enough that I’d be worried that older users might have trouble accessing them. And the stylus is a little flimsy. 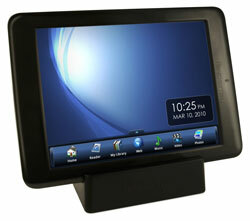 The 7-inch color touchscreen delivers a reasonably bright and crisp display at 600 by 800 pixels. Being a resistive display, it requires a firm touch to make anything happen—quite a departure if you’re used to the light swipes you’d use on an iPhone or even a laptop trackpad. If that were all, it wouldn’t be a problem, but the touch sensitivity is erratic. Even when you press or swipe firmly, often nothing will happen. There are two navigation bars—one at the top for the application and one at the bottom that provides access to the home screen and other apps. The bottom icons are labeled and the top nav is very intuitive. One issue, though, is that the navigation pane times out after 3 seconds, which often isn’t enough time to make your selection. 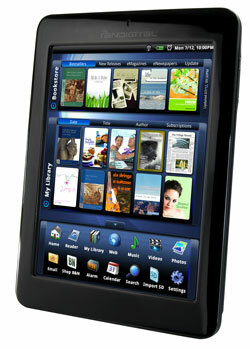 The Novel has a built-in sensor for auto-rotation. It works most of the time, but very slowly. Fortunately you can lock the orientation when reading. The onscreen keyboard has a nice tactile feel and is well spaced for the touch typist. It’s a little sluggish, though, and can get behind if your type too fast. Books are front and center on the Novel when you first turn it on. You can see books, magazines and newspapers profiled from the Barnes & Noble bookstore and selections from your own library. The Novel also reads PDF and EPUB ebook files, which can be borrowed from public libraries. To purchase reading materials, you can access the Barnes & Noble store on your computer or using the Novel, as long as you have a Wi-Fi connection. When you launch the store, you’re presented with a mostly text page outlining best sellers and new items. Selecting a book genre tosses you into the regular online store, which means you’re sometime presented with non-ebook versions. If you’re already set up a Barnes & Noble account, you simply log in to make your purchase (you can save your name and password for future purchases). Then you need to press “Update Library” to downloaded any new purchases to your Novel. In the upper right corner, you can bookmark any page and then access the list later. You can also add your own note, highlight text or look up terms in the onboard dictionary. In some ways, the Novel is actually a better web browser than a book reader. The Novel renders Web pages well and speed was acceptable, and tapping links registered a much more consistent response than the ereader's hit-or-miss navigation. It’s easy to read most pages without resorting to a lot of panning and zooming, especially when you’re holding the Novel horizontally. The browser doesn’t support Flash, which means no video or other interactive features will be available on many sites. In addition to books and browsing, you can also listen to music, watch videos (mpeg4 only) and look at pictures. You can load them through the included USB cable or load them onto an SD card (up to 32GB). The applications will automatically find them on the card for playback or to transfer them to the Novel’s 2GB on onboard storage. The entertainment apps are fairly rudimentary with basic control, playlist or slideshow capabilities. Email was easy to set up and use, but there is no forwarding button, which is just wrong. The Calendar and Contacts apps were useless, since you can’t sync them with your computer or cloud-based services like Google. The battery is rated at 4 hours with Wi-Fi on and 6 with it off, and that’s close to what I experienced. One major disappointment is that the Novel doesn’t charge via the USB cable. You need to use the separate power adapter, which is one more thing to pick when taking a trip. The Novel does come with a stand, though, so it can be used as a combo picture frame and alarm clock while charging. At $199, the Novel is pricey compared to the basic Kindle at $139 and the Barnes & Noble Nook at $149, with a sluggish, clumsy interface. But the Novel does provide full-color web browsing, something neither of those devices can handle. And, if the day comes where Pandigital delivers an upgrade to allow the Novel to handle the full suite of Android apps, it will be a full $300 cheaper than an iPad. That's when things will start to get much more interesting. Do you know when the black version will be available for purchse? I thought it was coming out today, August 18th, but no one seems to have ir or even know if it’s coming. According to Pandigital, it should be in BJ’s stores today, K-Mart later this motnh and Sears sometime in early September. Thanks. I called a few BJ’s in the area and tried Bed Bath & Beyond (who has the white ones), and no one seems to have them nor know when they will. I’ve been waiting for the launch of the black one for a while and am getting extremely impatient! I had grabbed the white one thinking there would be no great advantage to the black. A half pound lighter would be a great advantage. If the screen on black is more responsive, I may have made a mistake with the white one, firmware updates will improve both as time goes on, provided pandigital continues it’s semi serious support, but firmware updates will not improve hardware. I just wish pandigital would put firmware version numbers on the firmware update box on their support page or release dates. So I called a number of stores and am hearing that the black model isn’t due in stores until next month. Does anyone know where I can pick one of these up???? I got a black 2g (as opposed to the original white 1g for first generation) about 10 days ago from BJ’S in sanford, FL. BJ’s is an east coast warehouse club like sam’s and costco. Price was $159 with a $10 instant rebate and an included silicon ‘case’. IT DOES NOTHING THE WHITE PDN DOESN’T DO. It seems no more responsive or stable than the 1g, wifi seems about the same with an up to date firmware. 2g hasn’t been hacked yet as far as I know although it should be just as hackable as 1g, the display is slightly more white, the white areas of the 1g is more of a very pale grey. The back doesn’t seem to slide off. I do like the placement of the inputs, headphones, etc better but the weight / size difference is hardly noticable, without the silicon ‘case’ I would find the g2 to be too thin to hold comfortably. Overall I see no advantage for me worth the extra $35 I paid for the 1g to kohls so I plan on returning the 2g. radio. Anybody know how to do this. You have to mention the white Novel reader was recalled from all stores (mostly) in July 2010 because it was so buggy. I bought one in September and it was still buggy and I did the firmware update! Now you can load up Android 2.x on them and they are much better!